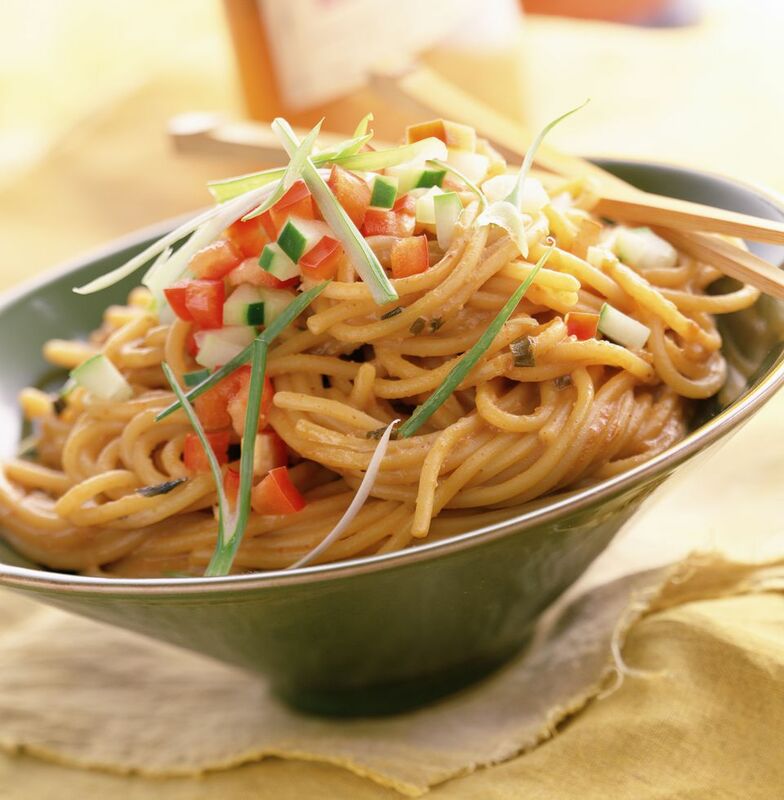 If you like Thai peanut sauce, try this vegan recipe for sesame noodles. Add a few diced veggies if you like, such as broccoli, snow peas, or bell peppers. Be sure to use rice stick noodles and a gluten-free and wheat-free soy sauce (such as tamari) if you need this recipe to be gluten free. Cook noodles in water for just a few minutes, so they are just beginning to soften but are not yet all the way cooked. Drain. In a large skillet, fry the noodles in 2 tablespoons of sesame oil, stirring frequently. Allow to cook for 3 to 5 minutes, or until noodles are soft. Remove from heat. In a large bowl or blender, whisk or blend together the 1 tablespoon of sesame oil, peanut butter, water, soy sauce (or tamari), tahini, sherry or rice vinegar, maple syrup, garlic and ginger. Toss this mixture with the noodles. Stir in the green onions. Chill before serving, if desired.